Anyone pursuing a career in education possesses an admirable goal in wanting to teach today’s students and to prepare them to enter life with the knowledge they need to succeed in the 21st century. Kindergarten teachers especially start with very eager, formative minds, so teaching children at these early ages builds a foundation on which to build the rest of their educational experience. While some children attend preschool, others do not. Kindergarten teachers have the responsibility of teaching these preschool-aged children, who are typically in the 4- to 5-year-old age range, the foundational skills of reading, writing, and mathematics. 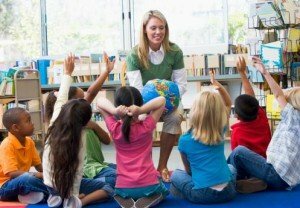 The minimum degree for entry-level teaching jobs is a bachelor’s degree, and those kindergarten teachers who work in public schools must have the appropriate teaching certification or license required by their respective states. The Bureau of Labor Statistics (BLS) projects a 17 percent job growth for kindergarten teachers between 2013 and 2020, a rate considered about as fast as average. So how do you become a kindergarten teacher? First of all, be sure you have the necessary patience to work with young children who are at the very beginning of their educational journey. Secondly, you will need a minimum of a bachelor’s degree in elementary education. You should check with your own state’s board of education to find out if you must also choose a major in a specific content area, such as English, math, or science. Additional courses may include basic education, as well as child psychology, and some universities also require you to enroll in their teacher preparation program. Your courses will focus on teaching you how to effectively work with young children of all abilities and backgrounds, as well as how to present information in an understandable manner. Most teaching programs also require you to complete a practicum or student teaching fieldwork. Again, make sure you check with your own state’s board of education, as many states are now requiring kindergarten teachers to earn their master’s degrees after obtaining their teacher certification. While kindergarten teachers in private or religious schools are not required to meet state standards for teaching, many of those school offcials still prefer a minimum of a bachelor’s degree in elementary education and give hiring preference to those candidates with degrees. Here at Web College Search, we are equipped to help you find the right school program, so you can begin training for your kindergarten teaching career. Find and fill out our easy sign-up form to receive all the relevant details about any school/s that interest you with elementary education degrees. Next, fill out your Free Application for Federal Student Aid (FAFSA), and then apply to the schools that best suit your needs. Please bookmark our site, as we can provide you with valuable articles and other information to help you along your educational journey. Online education provides the convenience and flexibility for you to pursue your bachelor’s degree in elementary education while perhaps continuing to work in another job and to maintain family obligations. Keep in mind, however, that most online education teaching degred programs will still require you to complete a certain amount of time in a classroom as a student teacher. You may often arrange this with a local school district, but be sure to check the details and requirements with both your preferred school and your college program. Online schooling would also be especially helpful if you already have your bachelor’s degree and your teaching license, and must now earn your master’s degree in elementary education. According to May 2012 Bureau of Labor Statistics (BLS), over 157,000 kindergarten teachers were employed nationwide. The median annual wage was $50,120, but annual wages ranged from a low of $32,450 to a high of $78,230. The job outlook for kindergarten teachers from 2013 to 2020 varies on a regional basis, but overall, the BLS predicts a faster than average growth for jobs in the southern and western portions of the country where student enrollment is expected to increase faster than in the midwestern and northeastern regions in the country.